The Warriors celebrate after winning their 4A state semifinal over American Heritage-Delray. 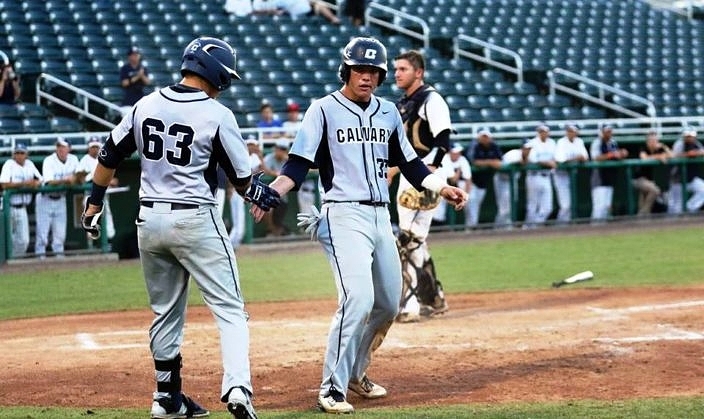 It has been a special season for the Calvary Christian Clearwater baseball program. 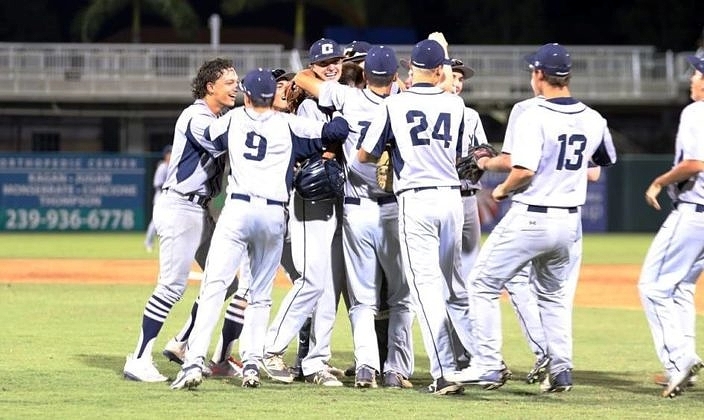 The undefeated Warriors have overcome every challenge they have faced this year, the most recent coming in a 7-1 victory over American Heritage-Delray in Friday night’s 4A state semifinal at Hammond Stadium in Fort Myers. Behind the same balance of pitching, defense and timely hitting the Warriors (29-0) now find only one more obstacle between themselves and the first state championship in program history. Calvary will face off against Pensacola Catholic on Saturday night in the final stop of an unforgettable season that has raised the program to a whole new standard. The Warriors have won games in nearly every way imaginable, trusting each other and playing like a true family. It is the only way the team knows, and the family atmosphere is a reflection of the larger Calvary Christian community. One more win and that extended family will share in state glory together forever. Facing a tough Stallions team that is deep in pitching and known for stout defense, the Warriors thrived just as they have all season. They scored all the runs they ultimately needed in the top of the first inning, the pitching staff held the rope in allowing only two hits all night and the defense committed just one error. That love is understandable for any passionate baseball fan, as this Calvary teams plays the caliber of baseball that is enjoyable to watch. With a strong amount of cheering and support coming from their fans in attendance, the Warriors accomplished what few teams manage in winning at the state tournament even despite being at the big dance for the very first time. Calvary got going right out of the gate, as Graham Hoffman singled, Matheu Nelson walked and Marco Benedettini reached with a bunt single that loaded up the bags. Cavan Ingram then delivered a hard liner through the left side of the defense to allow two runners to cross the plate for the 2-0 lead. The Stallions (22-8) answered back in the third to cut that deficit in half. Bailey Uderitz walked but was gunned down at home plate by left fielder Ritchie Mize as he tried to score on a double to left off the bat of Chris Ferara. Troy Hamilton immediately swung the momentum towards American Heritage when he jumped on an 0-1 offering and laced a shot deep into the right-center field gap for an RBI triple that made it a 2-1 ball game. Calvary starter Nolan Hudi held the rope the rest of the way to keep the Stallions off the scoreboard during the rest of his six innings of work. The sophomore left-hander allowed just two hits and five walks on 85 total pitches. Relying on a strong mix of fastballs and changeups, Hudi recorded four strikeouts to improve his season record to 10-0. The Warriors answered right back in the top of the fourth to extend their lead, as Eric Kennedy and Hoffman had back-to-back RBI singles. Justin Bench then laced a stand-up triple and scored on an error in the sixth, and Hoffman also crossed the plate off an error during the frame. Ingram then added another RBI single to close out the scoring. Sophomore Braden Halladay needed just 13 pitches to record the final three outs in the seventh. To reach this point with a perfect record and a team that truly plays as one unit is any coach’s dream. It is what every coach strives to have, and Olsen is just so proud in the way his players made that vision a reality. “I thought early on in the fall, just watching how our lineup could potentially be put together and how we could play defense, and how close our team was, I felt like we had a group that is really going to fight for each other and go out there and play hard,” Olsen said. 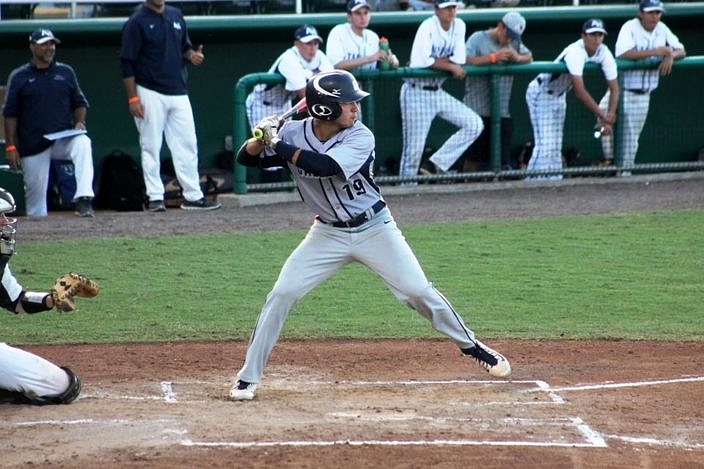 @cavan_ingram talks about his big day at the plate to lead Calvary Christian Clearwater to the 4A state championship.